anyone following avian flu fears? I have had some conversations about the current avian influenza outbreak with other veterinarians, particularly poultry and avian veterinarians. I agree with the majority of this thread in one respect: it's inappropriate for some of the USDA and poultry scientists to often discuss "backyard" flock biosecurity as a bigger problem than commercial poultry. Yes, our foraging flocks are potentially exposed to more natural pathogens. However, that's completely different then the infection rate or the fatality rate. I have started a blog on this several times, and every time I "almost" publish it, I get new information and more questions to answer. As far as the idea of thinking you might be able to be left with more flu-resistant poultry if your flock survives an infection.... well maybe. If some survive, though, that is no guarantee they are more prepared for another strain or that they aren't left in poor condition from the event. -I think you need to call if you have symptoms of the virus. I'm no more of a fan of USDA (in general) than most of you are. But they do have the resources and tools to track and attempt to control the outbreak. I'm trying to verify if they are requiring slaughter of all infected flocks. If they are slaughtering, there is probably replacement funding available. Again, don't assume that your personal flock can survive this just because they aren't as stressed as a confinement flock, or that you would be left with a healthy flock afterwards. We also need to consider that influenza viruses are very easily spread on fomites AND the more birds have this virus, the greater the chance that the virus infects a mammalian species. Even though I can't personally take part in the fieldwork with the USDA (and don't want to), I may see if I have time to take the online training and gather more information. -I'm looking for more specific data on mortality in different species. If they are slaughtering the infected flocks, then we have no way of knowing. There is of course a presumption that migrating ducks are carriers. I have yet to see if any domestic ducks are infected and if they are symptomatic. Looks like you did a decent job building something economical for the housing. Ours come back to their house every night. I think it has a lot to do with the fact we trained them to the house when they were young ducklings. As soon as they were out of the brooder, we started them in the house. We built a run on the house because we don't leave them loose constantly (the dogs aren't duck-friendly). They did increase their foraging area. They even found the neighbor's corn field, and went over there daily to eat the leftover field corn. Occasionally we find them just outside of the house at night, when the weather is decent, but it's easy to herd them in. My only disappointment is that, because they aren't as reliable as the chickens about going to the shelter, we can't use an automated door. I think the key to keeping Muscovies coming back, without clipping their wings, is to get them used to the house, give them plenty of space and bedding, and supply a perch. We also often gave them a treat of some sort when they went into the house at night, especially when they were younger. This didn't do any good once they discovered that corn field, but by that time they were always coming back at night anyway. The next generation won't be handled as much, because of course Mama Duck will handle the babies instead of us. So I don't know yet if keeping them around will be more of a problem or not. husky/german shepherd for guarding the farm? I agree with the emphasis on the genetics. The caveat is that if you already have a dog, or have some reason to take in another dog, you can work with it and see how it does. If you want to be convinced of the genetics of behavior, just watch your young poultry. Even those raised without a mother (like the chicks or ducklings you get at 1 day of age) show unbelievable instinctive actions: scratching chickens, swimming ducks, both species biting at imaginary insects but doing so in different ways. Likewise there is a reason it is so easy to teach a dog to be housetrained (the den instinct) and a cat to be litter-trained. You can switch those roles if you insist, but you'll put forth a lot of effort and only a persistent and quality training technique will get a dog using a litter box. 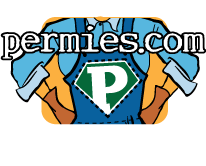 A few cats do potty outside, but that's probably because they've found their ideal "litter" out there and you certainly can't count on it when you get a housecat. We have a lab mix and a shepherd, both dogs that we had before the poultry. They are both good obedient dogs but their instincts are different. Some days you can see it just by watching them hang out. One day after a big snow the shepherd went charging outside to play, and make her usual "perimeter run" around the front of our property. The labrador stood there looking at her like "What on earth are you doing running in those useless circles. Especially in this deep snow. Sigh." We walked with the dogs out into the woods, where the labrador was sniffing at everything, digging through the snow, and submerged herself in the creek. The shepherd stared at her like "What are you doing? Getting wet, putting your mouth on everything. I want none of that!" When we first got poultry, we gave each of them a chance around the birds. Sara, the lab, could not overcome her hunting instincts. I was sitting with her while a chicken strolled by. She was fairly calm, then the chicken flapped its wings a little. Poor Sara started shaking and drooling. Roxy, the shepherd was actually great with the chickens. She learned the "leave it" command well when she was young, and she's never had much interest in killing prey. We had her around the poultry on leash, then nearby, then eventually out with them for hours. The adult and baby chicks could walk right up to her nose and there were no problems. However, we also had muscovy ducklings and she started to get a different interest in them. As the ducklings got more strung out in their foraging, Roxy couldn't handle the concept of 1 or 2 ducks on their own. Her herding instincts would overwhelm her and she put her mouth on the duck, injuring it. This happened twice, both times more quickly than we could prevent with a command. Sometimes the poultry are in a portable run for foraging, or fenced in a specific area. But if they are free-ranging, they can't be out the same time as the dogs. We just take turns. We will likely get a GP one of these days. I should have some pics for you tomorrow. I know that's a day later than you had hoped for but we'll see what we can get together. Our duck house isn't unique looking at a glance, but the more I think about it the more I think it might be appropriate for your points. We chose Muscovys particularly because of their foraging ability and ability to take short flights (predator avoidance). 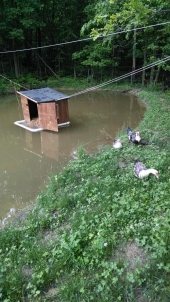 We put the duckhouse uphill from a small floodplain area. That area isn't suitable for much without a big investment, but the Muscovys find something to eat no matter what is growing. I don't know if our duck house alone has a permaculture look, but it's in the middle of an area where the ducks forage all day. We are still in the painting process, so may be able to send a pic in a week or 2. I do realize Muscovies will lay fewer eggs than other ducks. Some people do get several per week. The average seems to be 2 per week per hen. I still decided they were the best duck to start with, being more self-sufficient than the other breeds. I might get a couple of Khaki Campbell hatching eggs to put with one of the Muscovy hens when the time strikes me..... after we get a good house set up, get the ducks in the habit of going to bed at night, see what predators come after them, and especially if my dogs adjust. I'm hoping to let the ducks free-range most of the day; and like my chickens we will get a door on a timer to close them in at night. The good thing about the ducks being out with my dogs is that my dogs keep all of the OTHER predators away. (I've seen my Shepherd chase off raccoons twice, when my chickens were foraging in the woods). The bad thing is that my Labrador mix has a strong hunting instinct herself and we can't trust her out with the adult chickens. We are getting her somewhat acquainted with the Muscovies as they grow. She has adjusted to all other "housepets" like the rats my kids have. So I'm hoping that the day will come when she mostly gets along with the Muscovies and/or they learn to fly away from her in time. How that all works will help me decide if I can have non-flying ducks out foraging all day. My chickens do well being in a chicken tractor much of the day; we let them forage when we put the Lab in the house part of the time and they get a new space under their tractor each day. But I don't want ducks locked in a pen and have them living in a mucky mess. If my Muscovies are really POOR egg layers, I'll either have more (we have a lot of foraging availability, so maintenance costs are low) or we'll start using them more for meat. This post is timely for me. I have some Muscovies here that are just 2.5 weeks old and are going to need a coop soon! Currently, they are in the garage at night in a large dog kennel. They spend much of their day in a lightweight (would not be nighttime predator proof) run with a tub of water and some foraging opportunity. I read mixed comments on Muscovy housing: somewhat comparable to other ducks in that they won't go up a steep ramp. But I also read that they are more likely to use housing if they have perches. I'm not going to clip the wings on mine. I'm hopeful this will help them get away from some predators. But I do want to protect them at night. I'm hoping to get them to habitually "go to bed" and then get a closing door on a timer. That is what we have for the chickens and I really like it. Unfortunately, nothing of quality has popped up on Craig's list lately and I don't have the time to build one myself. We may have to try out the doghouse-style option if we don't find a larger coop soon. Julius.. Do you put up hay for winter feed? I am humbled by never before thinking about the process of extending pasture viability into the winter months. I won't ask any more questions now until I follow the basics for this! Hmmm.... I've only heard about diseased elms and morels. Wondering what others know. I'm currently going to continue to integrate plenty of bee-friendly plants, and start reading/preparing this year to perhaps actually undertake beekeeping next year. Thanks for coming to the forums to answer questions!